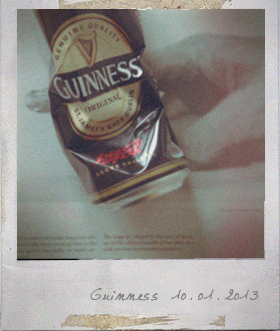 Dug up the buried yummy Guinness stew, yay! Happy New Year. Season the beef with the salt and black pepper, sprinkle with the flour and toss around until coated. Heat the butter in a heavy-based pan. Add the beef and fry until browned. Add the onion and fry for 3 minutes, then add the carrot, celery and garlic, cook for a further 5 minutes, stirring constantly. Add the Guinness, beef stock, Worcestershire sauce, thyme and bay leaf in the pan. Stir well and bring to the boil. Reduce the heat and simmer gently for about 2 hours until the meat is tender and the sauce has thickened. Remove from the heat and place into a deep pie dish and leave to cool completely. Heat the oven to 200C / 400F. Roll out the Puff pastry on a floured surface until slightly larger than the pie dish. Cut off a thin strip of pastry, brash the rim of the pie dish with beaten egg and stick the pastry strip around the rim, pressing it down. Brush the pastry rim with more beaten egg and lay the pastry lid on the pie. Seal the pastry edges with a folk, cut a couple of holes in the pastry to let the steam escape. Brash all aver with the remaining beaten egg. Bake for 35-40 minutes until the pastry is golden. 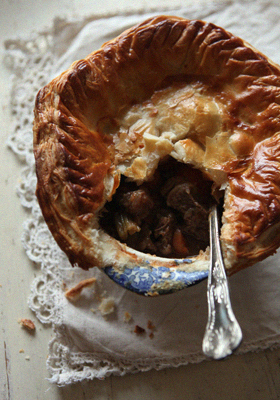 You are currently reading Steak & Guinness Pie at Fish Trip Cafe.